My sweet blogging friends (mwah) have been precious to give me blog awards and I've neglected sharing them. SO, Fridays shall be Awards Giveaway Day for the next few weeks. 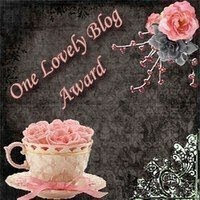 Today's award (tada) the One Lovely Blog Award was given to me by the sweet and hilarious Diana. If you haven't visited her blog, you are MISSING it. Her fun humor and writing wisdom will keep you coming back. Cata's Crafts and Illustrations - Full of gorgeous pictures of her crafts, collages and paintings. Wishes and Heroes - Fun surprises with his artistic wit. Your Life - Brief but powerful, this blog is whimsical with breathtaking photos. Starlight - Stunning pictures alongside intriguing prose. Life Goes On - Insightful poetry and nature photographs that move you. Shererart - Shining with the faces of angels and bouquets of flowers. I love how these awards encourage all of us and keep us going. It's like our online coffee. Catherine, I had a brilliant idea (says GwOE about her own idea) Take the picture of the "poo blob" and call it the "Poo Blob Blog Award" and pass it out to the blog you think keeps it real without all the bullsh--. Just a thought or way to keep the artful cute guy alive. And I agree with Void - online coffee. Hey I don't know if I'm the only one having this problem but the comment screen will not let me scroll down to punch in the "word verification" I had to try it several times before it let me. Voidwalker, online coffee is a perfect analogy! Catherine, Congratulations! And Thank You for passing this award onto me! Mary Anne, it's well-deserved. Maybe I'll give the poo man another showing sometime soon. Thank You, thank you, thank you Catherine! I'm so happy you like my works. A big hug from Tuscany.